When Heather with Lily Bee Design asked if I'd like to guest design for them I jumped at the chance! I love getting to play with new, awesome products! Lily Bee Design is right up my alley with bright colors, bold patterns, and a great mix of feminine designs for me and Jane and masculine designs for Chris and Fox. Journaling says: This picture was taken on Easter Sunday 2013 before we headed to church. Just a snapshot of our little family. Chris holding Fox and Paige holding Jane. We are a happy family! How to: Lightly distress the edges of a blue cardstock background. Punch 3" squares from each patterned paper in the Pinwheel collection and trim them into triangles again and again until you have a bunch of sizes. Place a photo on the top left side of the background and arrange the triangles around the photo. 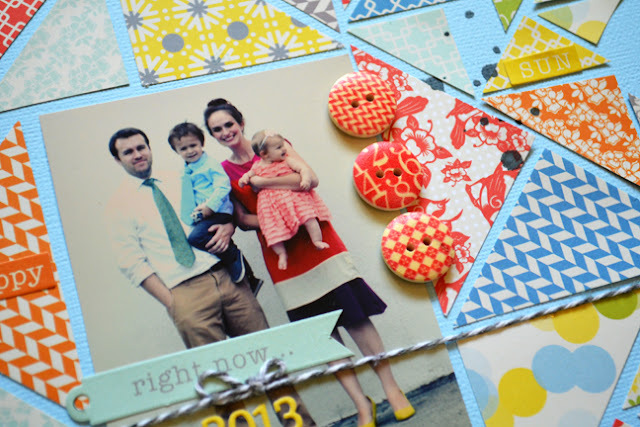 Embellish the photo with three patterned buttons, a sentiment pennant sticker, and number stickers. Place label stickers on the edges of the layout, trim the excess, and stamp the date on the left one and write journaling on the right ones. Attach a fabric brad on the left and right edges, connect them with a piece of gray baker's twine, and staple the twine in place. Drop black spray mist around the layout. 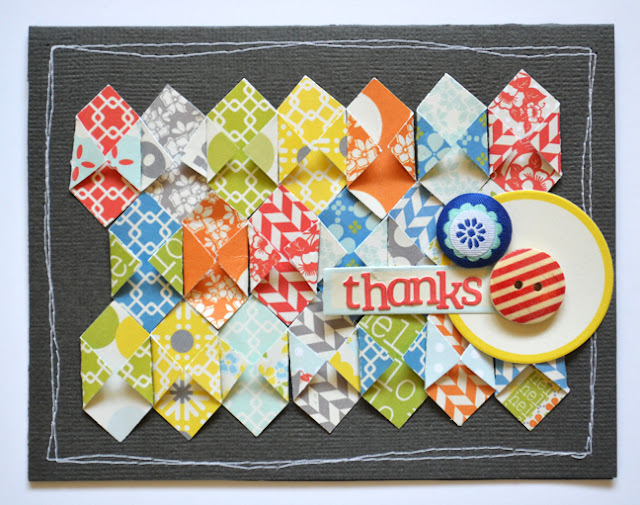 How to: Punch starbursts from an assortment of papers from the Sweet Shoppe and Pinwheel collections and arrange them evenly spaced across a cream cardstock card base. Stitch double circles around three of the starbursts. Add a pink "happy birthday" sticker to an aqua label sticker, place a bow tied with gray baker's twine at the top, and adhere the embellishment on the right edge; trim any excess. How to: Stitch a double border with white thread around a dark gray cardstock card base. Punch squares from the Pinwheel collection, fold the opposite corners of each square in to create a diamond, then arrange the diamonds across the card base in three rows. Layer label stickers, letter stickers, a flower fabric brad, and red striped button on the right edge to create a focal point and sentiment. How to: Trim a flower petal shape from cardboard then trace it onto both sides of every paper from the Sweet Shoppe collection, cut out the pieces, then sew around them to create a quilted look. Arrange the petals into a flower on a yellow cardstock background. 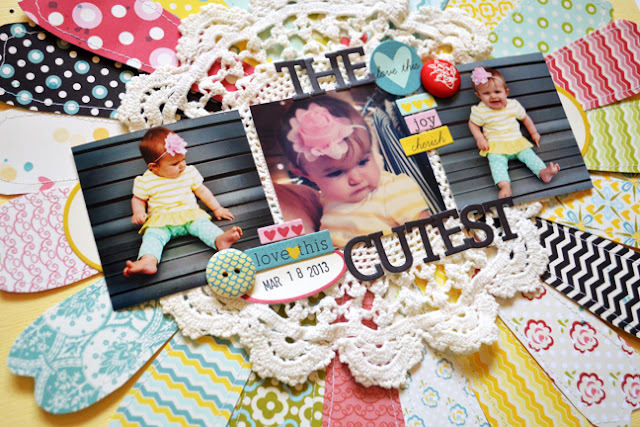 Add a large crocheted doily to the center and top it with three photos. Make a title from letter stickers and embellish with a fabric brad, patterned button, and an assortment of stickers. 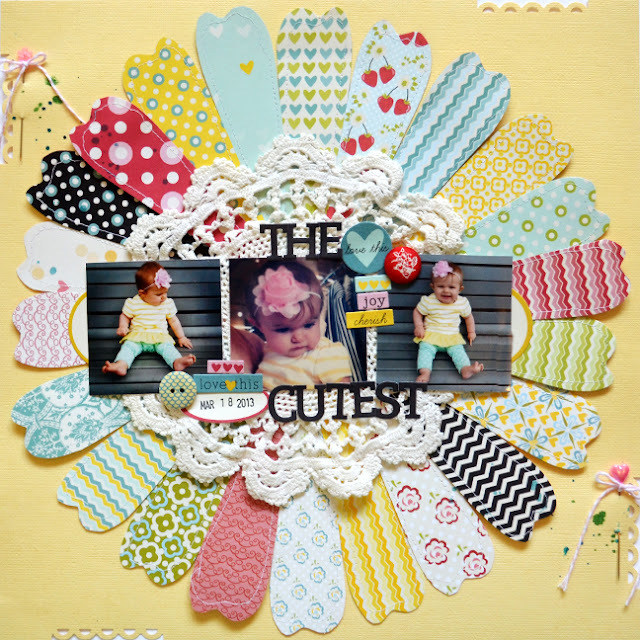 Punch a partial scalloped border on each corner of the layout. Pierce a stickpin with a baker's twine bow tied on it through two of the punched edges. Drop aqua spray mist by the stickpins. Journaling says: Fox is so flippin' excited every time we walk by this house and find some sticks for him to hold and wave around. What is it with boys and sticks? Whatever floats his boat! 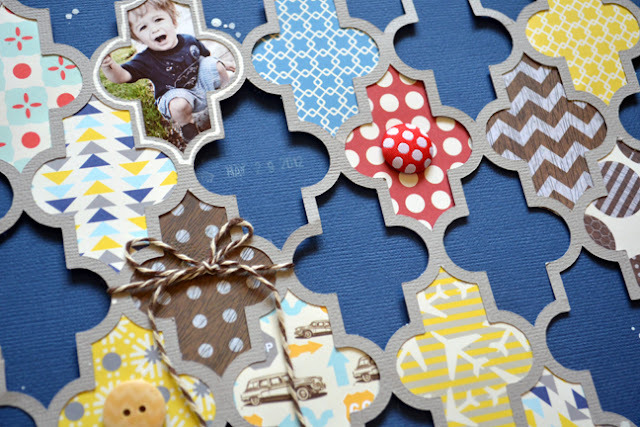 How to: Die cut a geometric background from gray cardstock then back most of the pieces with patterned paper from the Destination collection as well as four photos. Draw a border around the photos with a white pen to draw attention to them. Back one section with white cardstock and write journaling on it with a black pen. By the journaling add a letter sticker title in one section and place a sentiment label sticker and the date stamped on another label sticker tucked under a "GO" badge. Stamp the date again in white in a section on the top left side. Tie brown baker's twine in a bow around a section on the left side. 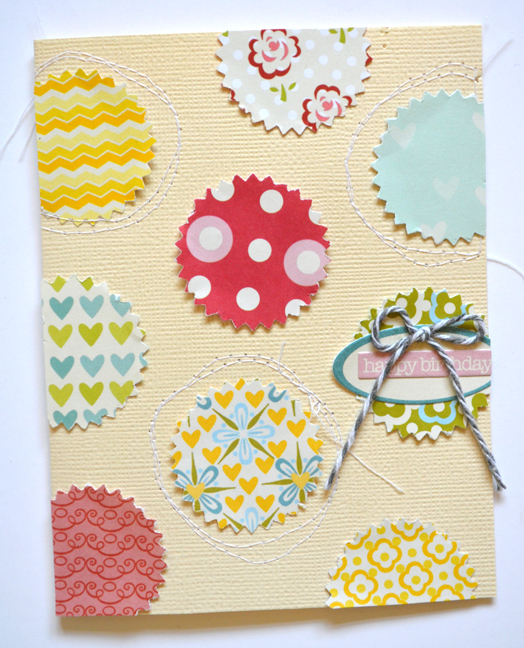 Place a red fabric brad and yellow button on sections with paper of the same color. Drop white spray mist across the layout. 2Peas will hook you up! I have been seeing your creations on their blog and just loveeeeeeeeeee everything you have made with Lily Bee! GORGEOUS!! Thanks for guesting with Lily Bee Design and sharing your amazing talents with us this month! Your projects are all so unique and inspirational. You seriously ROCK! WOW! What fun intricate projects. Very unique and gorgeous! wow, you rocked these paige! SO awesome! 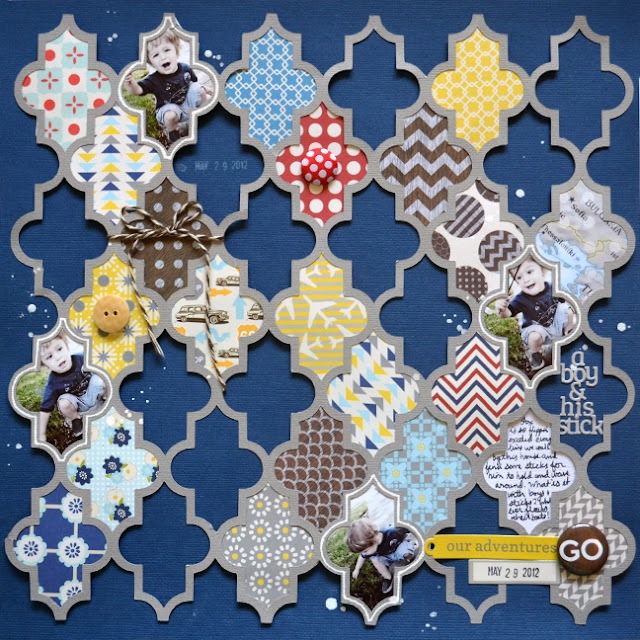 Fabulous layouts and cards....of course! Love the quatrefoil. Thank you for sharing. How much fun is your use of tons of different prints and fun prints at that. 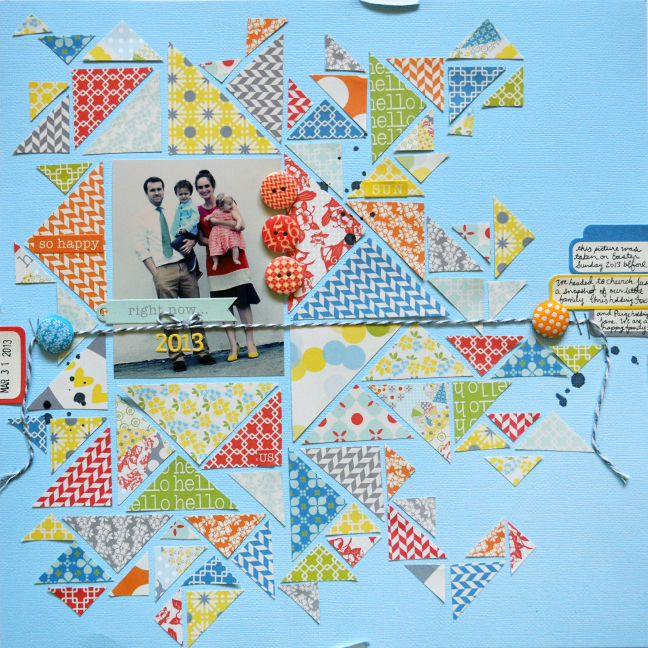 I have LOVED seeing your creations on the LB blog. Sooo amazing, gorgeous, and inspiring!! love seeing these on the LilyBee blog! Always an inspiration, gorgeous work! Wonderful projects! Love them all. A stick! Coolest thing ever! I love Fox's enthusiasm about so many things. He sure is fun!